This year we’re excited to partner with the WestEdge Design Fair happening October 19-22 down the street in Santa Monica! WestEdge features the latest products and design inspiration from 150+ premium furnishings brands. Design seminars and exhibitions, culinary demonstrations, book signings and special events, including an opening night party to benefit Los Angeles Ronald McDonald, round out the experience—all in an environment that will engage, entertain and inspire you. More than 40 new exhibitors will join the fair in 2017, highlighted by brands such as Koncept, Foscarini, M2L, Neutra Furniture Collection by VS America, Croft House, PELLE, Brizo, TRUE Residential, Monogram, Fyrn, Juniper House (which represents the globe’s leading exterior furnishings brand) and dozens more. There is a struggle for the soul of LA over growth. Does it threaten the architectural creativity that has made LA famous? 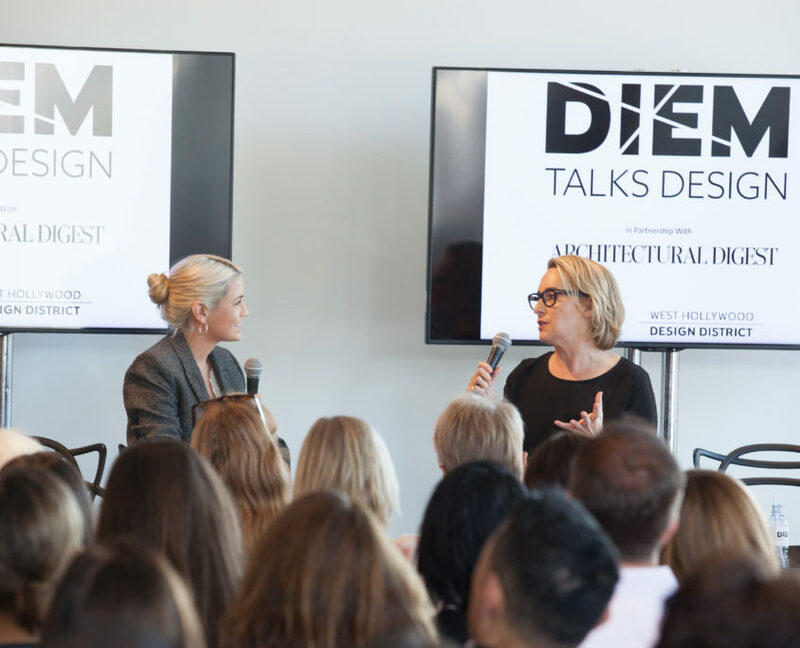 DIEM opens with a conversation between Frances Anderton and Michael Maltzan, architect of many pivotal LA projects including the Sixth Street Viaduct Replacement Project and One Santa Fe, and editor of No More Play: Conversations on Urban Speculation in Los Angeles and Beyond. Despite ongoing retail shake-ups, and the meltdown of malls and main street shops nationwide, inventive shopping destinations are cropping up in Socal. Hear more from their creators. The Green Rush: Is High Design Taking The Edge Off Marijuana? Design is entering the picture as Cannabusiness seeks to shed its hippy image. Do we want to get our hit in shops that resemble coffee bars or eyeglass stores? Who’s driving the new look and feel of marijuana marketing? From the streets to the skies, mobility is being reimagined. But how much are smart ideas improving mobility in LA right now? We’ll talk about the transit revolution taking place in the city that the car built, the great disruptors behind it, and how city-makers turn the imaginary into reality. When disruption is the new normal how do you stay ahead of the game – or at the least stay in it? A conversation about managing massive change. Make plans to join the design community at WestEdge 2017 by registering HERE.